The Sioux Land that was home to the tribe, had been occupied by the tribe before the arrival of the Europeans. They had never experienced the way of the Europeans especially in relation to the subject of Land Ownership. The ownership of Sioux land became the source of the bitter conflicts between the white European settlers, the U.S. and the Native American Indians. 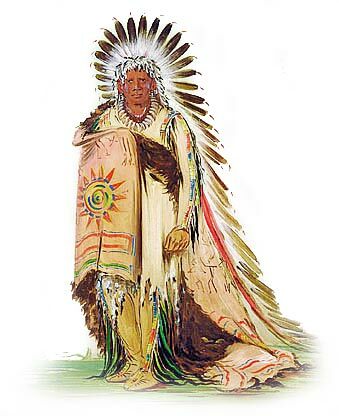 The Sioux Native Americans lived in harmony with the land which was emphasized by the their culture, religion and beliefs. The idea of an individual person having exclusive use of a particular piece of land was completely alien to Native Americans. The Sioux fought, as communities, with other tribes over hunting rights to their territory. But the "right" to the land was very different from the legal terms understood by the white settlers relating to individual ownership. The Sioux Indians had no concept of "private property," as applied to the land, but were soon to experience this European idea, through the constant encroachment on the tribal territories and Sioux land. The American Indian Wars is the name used in the United States to describe a series of wars, battles and conflicts between American settlers or the U.S. army, and the Native American Indians before and after the American Revolutionary War. The U.S. agreed treaties with the Sioux in 1815, 1825, and 1851. However treaties were broken and in 1862 Chief Little Crow led the Sioux in revolt leading to the death of over 800 settlers and soldiers in Minnesota. The revolt was crushed but unrest continued. In 1867 the Sioux gave up a large section of territory and agreed to retire to a reservation in Dakota by 1876. The gold rush in the Black Hills of Dakota sparked another revolt under the leadership of the Sioux Chief Sitting Bull (c.1831–1890) together with Red Cloud, Crazy Horse and Chief Gall. They led the Sioux in the Battle of Little Bighorn against General George Armstrong Custer. The last major conflict fought by the Sioux was the Battle of Wounded Knee which resulted in the massacre of more than 200 members of the tribe. The Sioux were defeated and the U.S. imposed forced settlement of the Sioux on a reservation. The Dawes General Allotment Act was passed by Congress in 1887 which led to the break up of the large Indian Reservations and the sale of Indian lands, including Sioux lands to white settlers.